An adorable piece that will bring alive any entry or porch! This "shovel", made from pine, features an adorable painted snowman and primitive tree with garland and lights wrapped around the handle! Your guests will love being greeted by the snowmans adorable smile and rosy cheeks! It's so cute, you won't feel bad about leaving it out until Spring for everyone to enjoy! 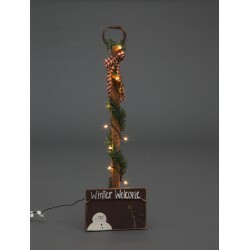 Add some rustic country charm to your home this holiday season with this handmade primitive "Winter Welcome" lighted snowmen shovel decoration. A pleasant addition to your Entry Way, Living Room, or Front Porch. Cheerful, rustic snowman lighted shovel decoration. Lights included. The soft glow of this lighted snowman shovel will warm your heart this holiday season and all winter long.